Hello ‘Fetti Fans and welcome to the February Confetti Creative Hop! It’s the 8th of the month and, as you know, we hop on the 8th of every month. Since this month is a non-release month, we “just” have some fabulous Confetti Creativity to share with you. 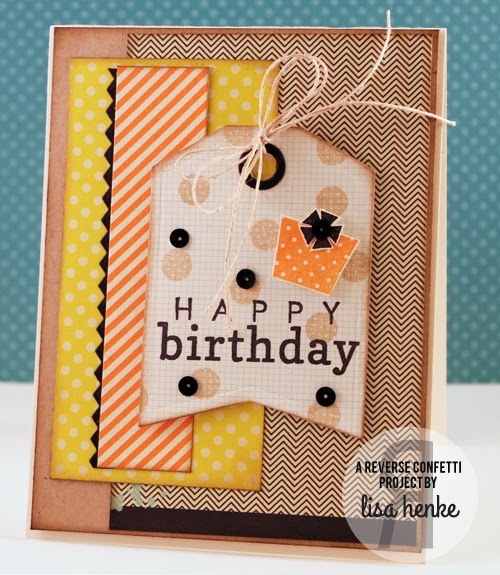 We know that you love to see Anything But a Card projects and that is what we have for you today! 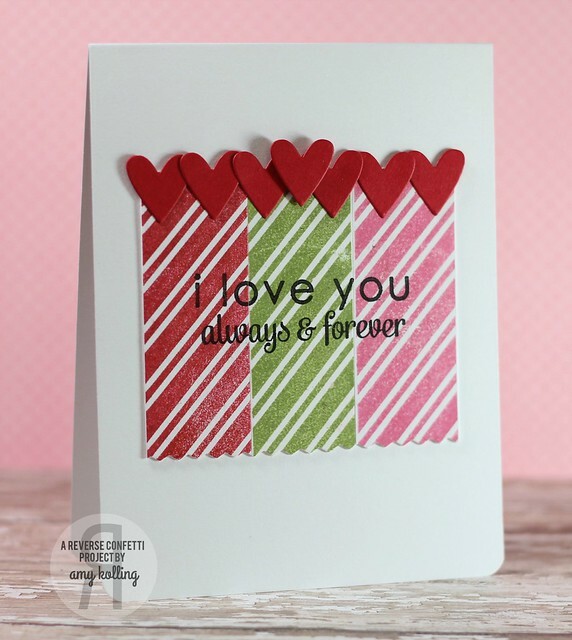 There’s a Valentine’s theme to all our projects, but these really can be used throughout the year with a tweak of a sentiment or color scheme. I had a Valentine’s sale planned for next weekend, but I figured today is as good a day as any to tell you that WE LOVE YOU with a 3-day sale. We really do love all our ‘Fetti Fans! Be sure you share your Reverse Confetti creations with us! The coupon code is valid February 8, 9 and 10 on new retail orders placed through the Reverse Confetti site. The coupon code must be entered at the time order is placed. No refunds or adjustments will be made. Limited to in stock items. No rainchecks. I was recently sketching out a die design for a box when I had a little bit of a “lightbulb moment.” The shapes that I was working with were are part of our TAGGED TOTE Confetti Cuts die set. I ran up to my studio to see if what was in my head would work. It is my pleasure to say, “YES…it worked” Don’t you love when that happens!?! 1. Cut 4 of the rounded top tag from the TAGGED TOTE Confetti Cuts die set and 1 square measuring 2 9/16″. 2. Score all 4 of the rounded top tags at 1″ from the straight edge. 3. Score 2 of the rounded top tags at 1/4″ from the rounded edge. 4. Layer the 2 rounded top tags that you scored in step #3 and punch 2 holes side by side. 5. Attach 2 panels to the bottom of your square. The 2 with the holes punched at the top must be opposite each other. 6. Attach the other 2 panels to bottom of square. (optional) 7. Cut another 2 9/16″ square, stamp/embellish and add to inside center. I stamped the “It’s ‘o-fish-al’…” sentiment from SUGARY SWEET SENTIMENTS and my daughter’s name with LIGHTHEARTED LETTERS. 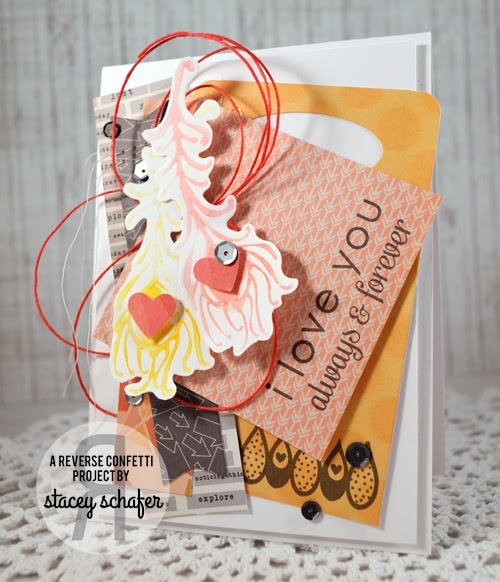 The heart is cut from red cardstock with the LOVE NOTE Confetti Cuts die set. 8. Add treats. I used Swedish Fish to coordinate with the sentiment. 10. Pull hole punched panels together and close off with ribbon. I am so pleased with how this turned out and how quickly it came together. I know I’ll be making a few more of these and giving them out as little gifties for friends, family, teachers and neighbors. I can already see pastel colors and jelly beans as little tweaks to make these more spring/Easter themed. It’s DAY TWO of our COUNTDOWN TO CONFETTI (sneak peeks). 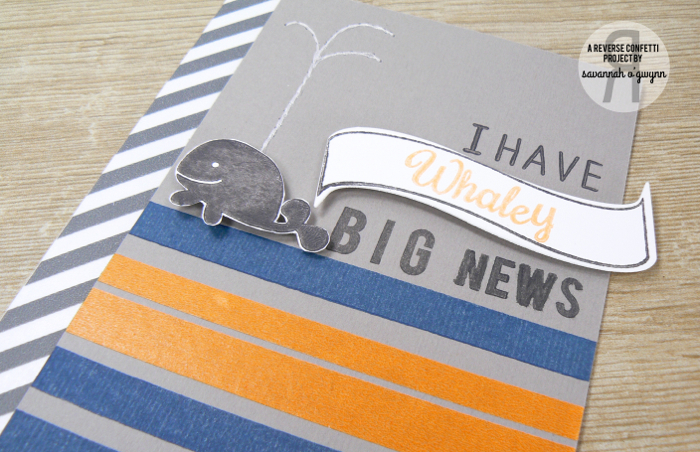 We are so excited about our November 8th release featuring 4 new stamp sets and 7 Confetti Cuts die sets! We’ve been taking note of a new trend…DONUTS! Just looking at that picture is making my mouth water! The DONUT YOU KNOW stamp set is full of cute, witty and sweet (of course) sentiments (and sprinkles!) that pair perfectly with the coordinating Confetti Cuts die set. This is a set of 6 Confetti Cuts dies: the donut base, the icing, the hole to cut the center of donut and frosting, as well as 3 different perfectly sized sprinkles. You’ll be whipping up the cutest baker’s dozen in no time! The best part?…no calories (and they’re super cute!). My first card today features both the DONUT YOU KNOW stamp and Confetti Cuts die set together to make a sweet birthday card. You could switch up the colors of the sprinkles to personalize it for a boy or girl…or even your recipient’s favorite team. 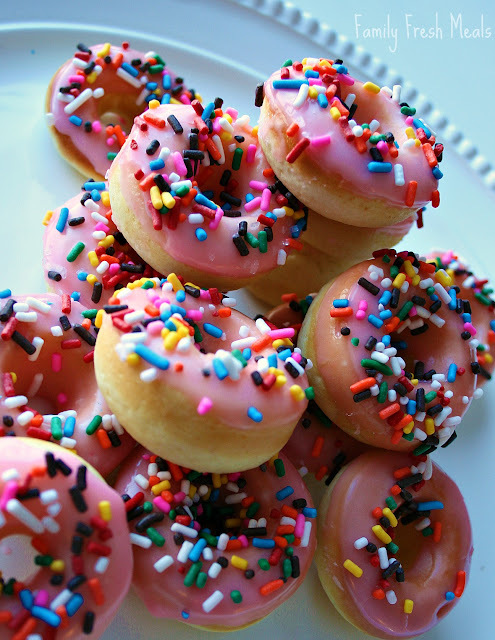 Of course, there are lots of ways to dress up your donuts! I’ve had tons of fun playing around with different ways to create a variety of different frostings. For this particular card, I used Ranger white enamel (that I’ve been hoarding for a few years now), along with a white and silver glitter mixture that I picked up at Michaels (there’s a pic of it a little ways down on this post). I sprinkled the hearts and rectangular sprinkles in two different colors of pink to create the perfect (girly) confection. And, as you may know, sprinkles tend to fall off here and there so I made a sprinkling of sprinkles around the donuts on the card. 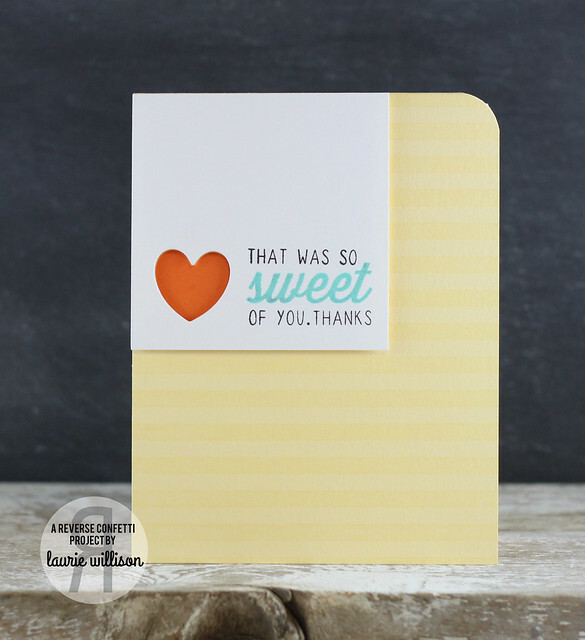 The sentiment is stamped on the rounded rectangle from the CLASS ACT Confetti Cuts die set and sewn on the card. Notice anything else on this card that is new? It’s subtle, but it’s there! On the card above, I layered it under my main image panel to give some dimension and detail without taking away from the focal panel. 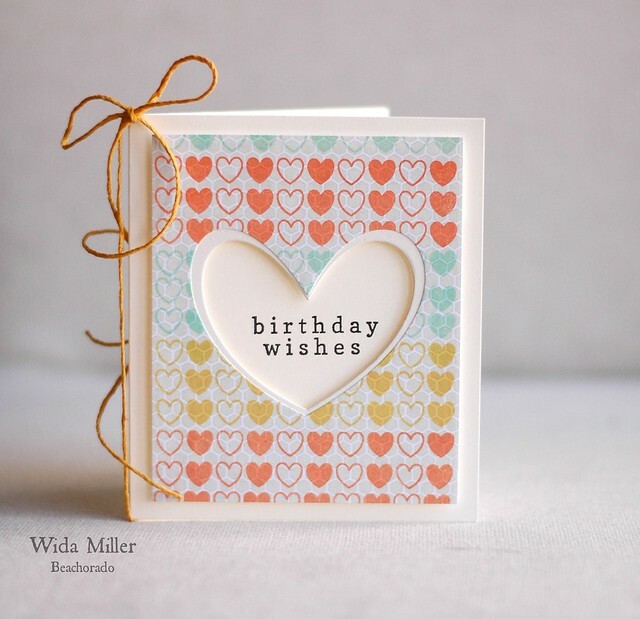 I also used this Confetti Cuts die on the inside of my card that I peeked on Monday for the Caring Hearts Blog Hop. What’s inside? Real donuts, of course! The scalloped edge detail was created by cutting a pink piece of cardstock with the DOUBLE EDGE SCALLOP BORDER Confetti Cuts die. For this frosting, I used t-shirt paint (!! ), the glitter from Michaels that I mentioned above and some cute lil’ sequins…because some donuts need bling! Donut You Know That You’re The Best? We love that donuts are trending right now and Donut You Know is the must have donut set! This witty and fun stamp set features 7 donut themed sentiments (a couple are mix and match) along with 3 sprinkle images that coordinate perfectly with our Donut You Know Confetti Cuts die set. The Donut You Know Confetti Cuts die set coordinates with the Donut You Know stamp set. No need for any cooking skills here. It’s as easy as 1-2-3…Cut the base of the donut along with the hole for the center; create the icing also with a hole in the center and finally sprinkle on hearts, stars, sprinkles…and a lot of love! You’ll have a baker’s dozen in no time at all. And the bonus is that these are calorie free! This stand-alone Confetti Cuts die is sure to bring lots of fun detail to your paper crafting projects. As part of our Winter Collection release, it pairs perfectly with the holiday themed stamp set, but will easily carry over for use all year long. It’s a great detail for both the outside and inside of your cards, as it will stretch all the way across an A2 sized card. 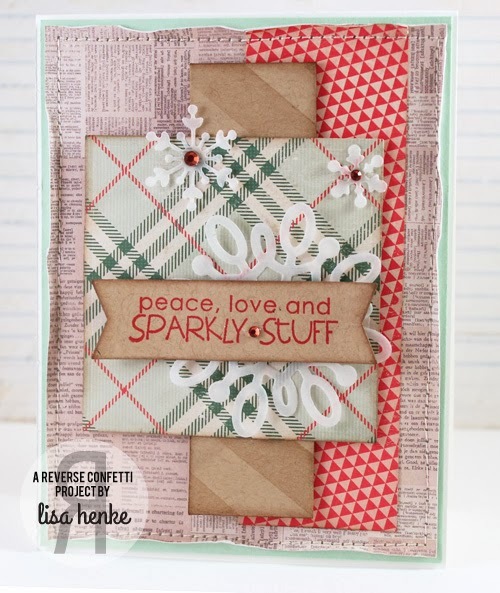 Layer it or make a long string of garland on your paper crafting projects. It’s my birthday and I have a present for you! Coupon is valid on new orders placed on 08/13/2014 at www.reverseconfetti.com and is limited to in stock items. 1. On the CART page, below the items in your cart there is a box to enter the coupon code. 3. When coupon has been applied click “Proceed to Checkout” and complete order. Did you see that we are a sponsor for the Pretty Pink Posh hop on August 22nd? 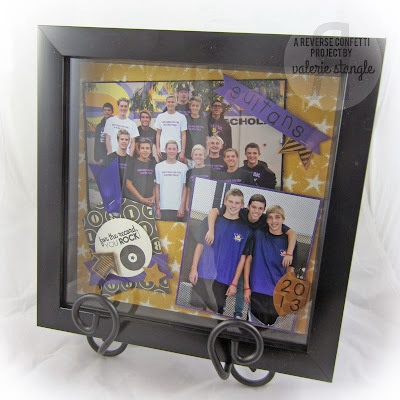 Order your Confetti Cuts today and play along! Date: The blog hop will start on Friday, August 22nd, 2014 at 6AM, PST and will run until Monday, August 25, 2014 at 11:55 PM, PST. Where: It’s taking place on the Pretty Pink Posh blog. We will have a link-up widget where you can link up your project and then hop along and see what others have created. Who: We want EVERYONE to be involved. 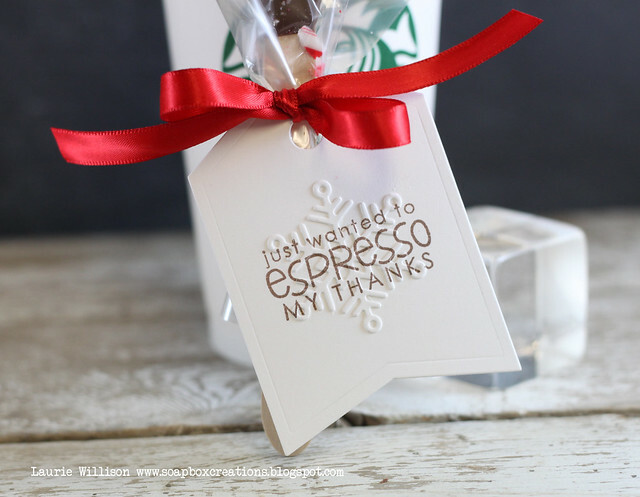 If you love adding die cuts to your projects and have a blog, you are welcome to join along. EDITED: The super duper sweet Confetti Crew gals planned a birthday hop for me (awww!!!) Here’s the line-up (edited from links I had on my post earlier). Thank you, girls!!!! 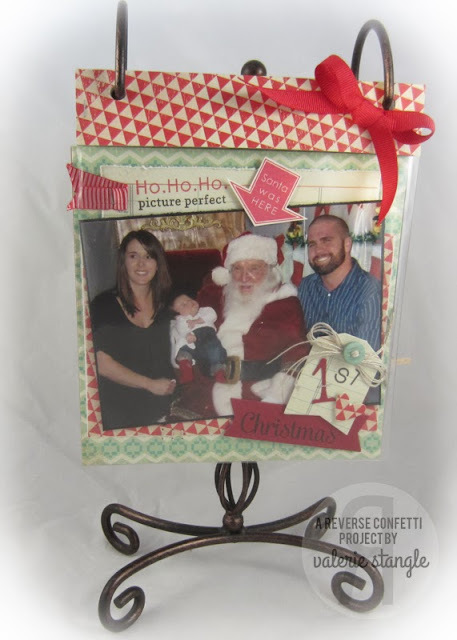 Paulina from Pretty Pink Posh has a great project and video for you to see, too! 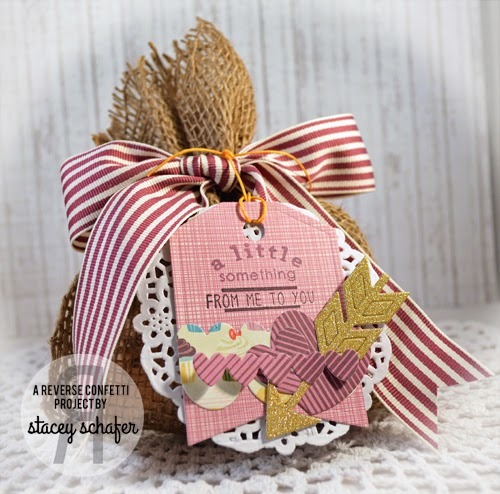 And, then topped it off with a cute tag using the TAG ME, TOO Confetti Cuts die set, CLASS ACT stamp set, CLASS ACT Confetti Cuts die set, LIGHTHEARTED LETTERS stamp set and TAG ME Confetti Cuts die set. Hello, TGIF and Happy 4th of July, ‘Fetti Fans! Just a quick reminder that the COUNTDOWN TO CONFETTI STARTS TOMORROW! 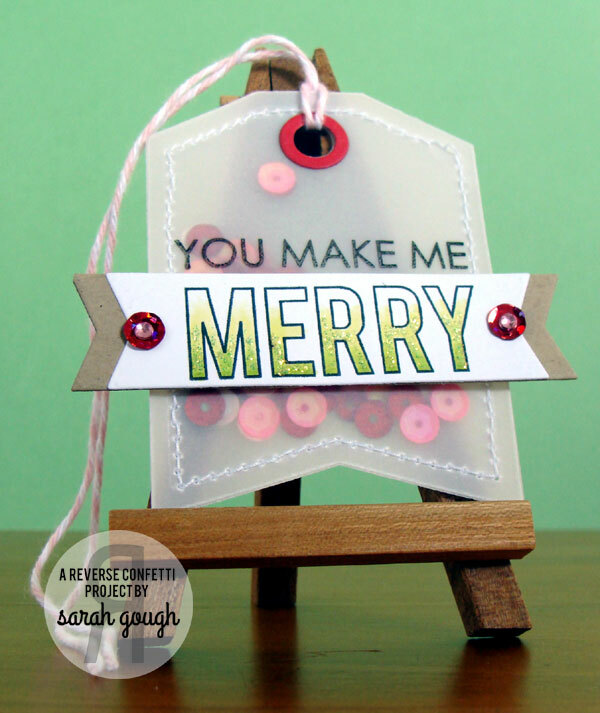 Join us here on the Reverse Confetti blog for sneak peeks, full set and Confetti Cuts reveals, tons of inspiration and, of course, chances to win! It’s Friday and we are taking a look back at what the fabulous Confetti Crew has been up to this week! Have you played along in our July SKETCH FOR YOU TO TRY? 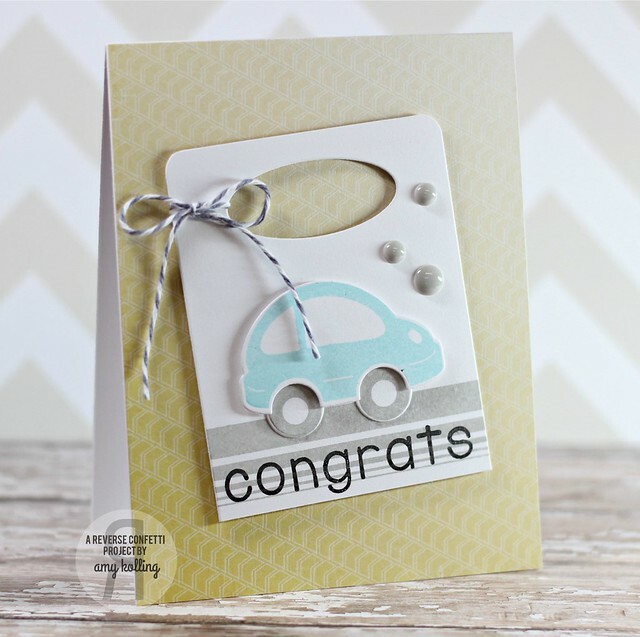 It’s time for the June Creative Blog Hop and you are going to LOVE what the Confetti Crew has come up with for this hop! So, grab that cuppa joe, sit back and click on through this amazing hop featuring cards and much much more! Be sure to leave a comment at each stop along the way for a chance to win a $15 gift certificate to the Reverse Confetti store. Comments are open until this Tuesday at noon and the winner will be announced on the Wednesday in the Works. Happy hopping and good luck! So, how many Reverse Confetti products can you name on this project? Two? Three?? How about SEVEN! It is so fun to be able to use products over and over and mix ‘n match to create new and unique projects! There is a whole lot of inspiration and great project ideas along this hop, so I won’t keep you here any longer. Don’t forget to leave a comment on each stop along the way for a chance to win! If you are here for the Season’s Givings Hop, it’s just below this post or you can click HERE. TGIF on the first Friday of the year! We are just a couple of days away from the start of our sneak peeks! 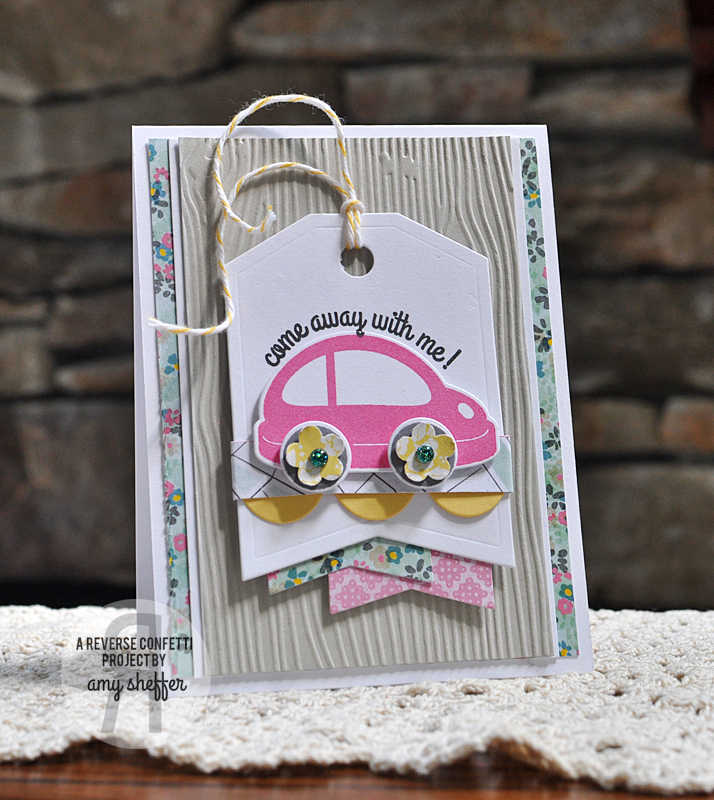 You won’t want to miss this “lovely” release featuring new stamp sets and new exclusive Confetti Cuts dies! We have had several inquiries about various products that are currently out of stock. We are working on restocking all of our products. We have a shipment coming in (later) today and will have inventory updates via our Facebook page and newsletter. Well, being that it’s Friday it is time for WEEK IN REVERSE where we take a look back at what the Confetti Crew has created this week. Val’s flip album scrapbook pages always make me smile! 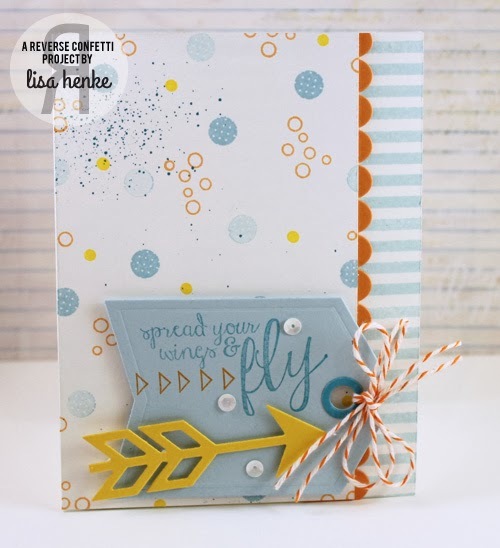 Great combination of stamps to make a darling page! Leigh also created a gorgeous scrapbook page! 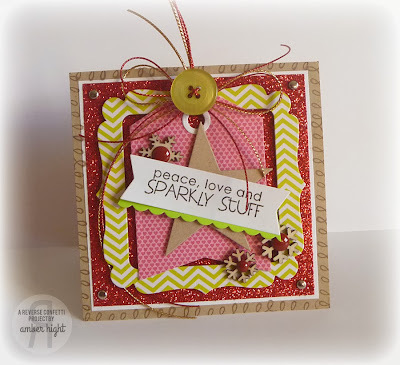 I love how she mixed stamps with scrappy elements to get this look! 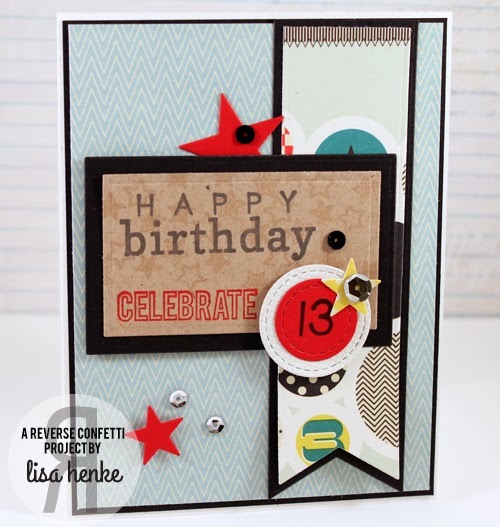 Leigh also created this fun chalkboard technique card. Savannah always has a fun take on the SKETCH FOR YOU TO TRY. 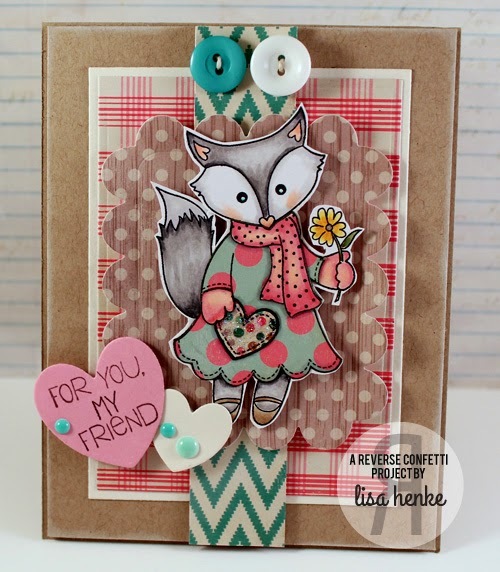 Lisa’s SKETCH FOR YOU TO TRY card has a so many fun details and I love her use of color! 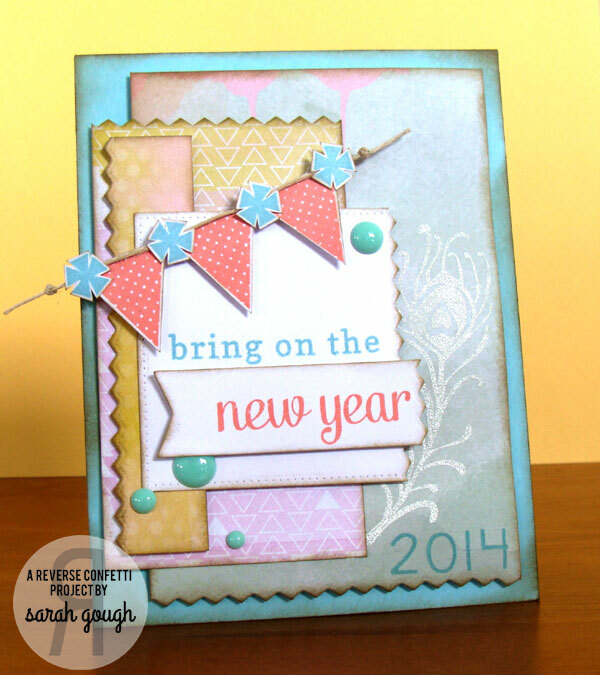 Sarah’s card using the new SKETCH FOR YOU TO TRY is perfect (crafty) way to ring in 2014! Stacey has such an eye for detail and certainly knows how to layer! This is fun take on this month’s SKETCH FOR YOU TO TRY. Come play along in the January SKETCH FOR YOU TO TRY for a chance to win!